Although we do love cooking and baking here on FBG, we also love raw foods. And not just kale and the fruit in sangria. While we haven’t done that much raw-food preparing (you can’t really call it cooking if you don’t cook it, can you?) other than salads, we recently got this healthy peach cobbler recipe from Karolina Eleonóra, a Swedish raw dessert chef, author, artist, and a distributor of raw and super food. Her blog Love Raw features nutrition info, healthy raw recipes and simply gorgeous photography (see right). 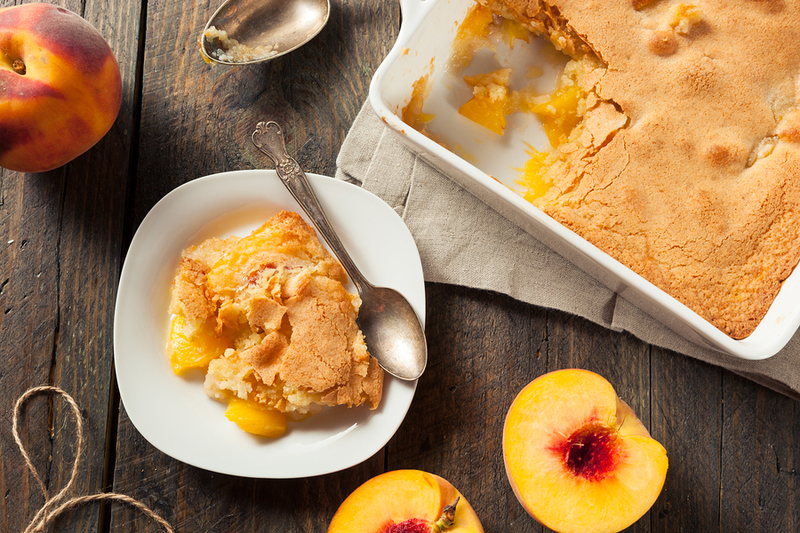 Read on for her raw and healthy peach cobbler recipe that she graciously lent us from her new e-book, The Dessert Revolution (which is—as the title states—truly a revolution)! 1. Grind the walnuts in a food processor with the salt and mesquite, set aside in a bowl. Make a date paste of the dates and then add the dry ingredients to the paste. 2. Process until you have a dough. Press down the dough in a pie form (or three small ones as shown in the image), using your hands and a wet spoon to even out the surface for a prettier finish. Put in the fridge to chill while making the filling! 1. Grind the cashews into a fine flour, using a coffee grinder or a high powered food processor. Add the rest of the ingredients except the coconut oil to the food processor and process until completely smooth and super creamy. 2. Add the coconut oil and process for a maximum of 30 seconds. Pour over the pie crust, and put in the fridge to chill, while you make the Pecan Cobbler Crumbs! 1. Pulse the pecans shortly in a food processor or blender. You want crumbs, not a flour. Put the crumbs in a bowl and add the rest of the ingredients, stirring by hand. 2. Sprinkle the crumbs over the filling, and cut slices of peaches to put on top. Add some more of the crumbs over the peach slices. Put in the fridge to chill for 30 minutes. Then EAT!